BEHAVIOR/JOURNAL due today, Thursday, (in my box, if not brought in to class), to be returned at Dec 5 session. Ideally, (it’s not too late!) share appreciation and feedback with others you have been involved with in your change work. These are opportunities to educate the rest of the class and warm up and get feedback for your community presentations. Completed by your whole group 10-20-pages (2 copies due in my box at Sibley, on or before Friday Dec 14 at 2:00, or second copy given directly to project guide) in collaboration with your project guide and/or community group. Be sure to share an outline and/or rough draft and discuss with them before completing the report. Goal: A synthesis and COMMUNITY RESOURCE that can educate and engage the community/organization it serves and carry the project forward through future groups. Content & form can be modified with approval of Project Guide to suit project needs. Think of this as an effective public education document, a user-friendly handbook for community groups and future project teams. Method: You are encouraged to be creative, and engaging, but still cover the content You can divvy up the writing among team members, but whole team, should be involved in conceptualizing the core content and in editing and coordinating the final draft so its coming from a collective intelligence. Remember to include your guide and/or community group early on in the process so you know it is addressing real needs. EACH team member will hand in a 1-2 page reflection on the project, electronically or in hard copy in my box at Sibley, on or before the last day of finals (Dec 14, 2 PM). Topics to cover: A) My evolving role and leadership in the project and in the group process. B) What I saw and learned in the team's development as a learning community and as a sustainability/social change action team. C) How the project work integrated with the course work for me. Overarching insights. D) Other observations and lessons learned, such as how to improve the project work in the course. Congratulations on a great job last night, Greg, Carlos, Gabriella, Caitlin, Libby, Maya, Kendra and the teammates supporting them! Many people, including a couple of public officials, have told me how moved they were by your sincerity and dedication and the quality of the presentations. It was also great to have more contact with the IC teams. And thanks for the good food, it made the evening festive and easy for others. This kind of campus/community interaction is very exciting and important. You are making a positive difference! Next Tuesday, we will have an opportunity to get to the many PRESENTATIONS you are eager to share. Please tell me if there is a mistake in this list and also what you will be presenting about, so I can see if there's any sensible order. Continue BEHAVIOR/JOURNAL work, (continue the Personal & Community Health thread, if you like). We will have time set aside for sharing on Tuesday. Observing how you fare with this when the crunch time happens is an important part of the learning. Continue PROJECT work, first and foremost. I am finishing up project-specific variations of Project Reports with guides. They are due during Finals Week, < NOT last week of classes> after incorporating feedback and insights from doing from presentations. Of course, you can get started on them earlier on in tandem with presentation work, and make the changes later on. digitally mapping the language of ecology. Application of readings (Roseland ch. 11 “Housing…” and Beatley Ch. 10 “Building Ecologically…”) to Denver, Colorado. “Ideally, closeness to other people is mirrored in a closeness to nature and integration of ecology into community living” (Roseland, 156). During my time working at a transitional housing program for homeless families in Denver, I found myself constantly wondering what type of setting would facilitate community building between the families we were working with – to promote empowerment amongst the people as opposed to continued reliance on government assistance. I found it so unfortunate that the families who had gone through such similar turmoil and hardship in their lives, who could benefit from their empathy to build relationships and self-reliance, would often end up fighting, putting each other in danger, taking no responsibility for their shared housing, and choosing isolation over interaction. From my background in environmental design and architecture, I had a suspicion that much of the issue had to do with the poor design of their housing and surrounding neighborhoods, but I wasn’t sure what would help. (Although I remember thinking maybe they just needed more trees along their streets – but dismissed the thought thinking ‘too simple…but now I’m learning I was on to something!) When I came to the Design and Environmental Analysis program here at Cornell – my main hope was that I would learn about neighborhood-design-interventions that might facilitate the community-building processes that I had seen lacking in the mainly subsidized-housing neighborhoods I worked in. So… my thesis work has ended up focusing on Community Gardens and how they are a sort of “sanctuary” setting in a chaotic urban environment. My hope now is that after I graduate and move back to Denver that I will find a career where I am working with the community to solve the housing crisis as well as the community and social justice crises. So, needless to say, I found the Roseland “Housing and Community Development” chapter to be extremely meaningful and applicable to Denver city planning and policy! I appreciate Roseland’s suggestion to design neighborhoods where residents can thrive. This statement really resonated for me: “To create a ‘sense of place’ and foster connection among people, the physical characteristics of neighborhoods must draw people together and encourage an atmosphere of peace, security, and pride among residents of a community” (156). Beatley mentions the community of Oikos (the Netherlands) where the physical design is intended to facilitate interaction between residents (297). These ideas from the readings are reminiscent of a statement from Jules Pretty, (professor of Environment and Society at the University of Essex) in an article titled “How nature contributes to mental and physical health,” where he suggests that policy makers and planners should focus efforts towards creating “healthy environments in which people can flourish rather than flounder” (Pretty, 2004, p. 69). It is so imperative that planners realize what an opportunity they have to create environments that not only “cause no harm” but go as far as to improve health and wellbeing. As I’ve mentioned in a previous blog, but I think it’s worth mentioning again, energy efficient housing is extremely important, after seeing some of my former clients public service bills which were near $800.00 – 1,000.00 /month. The chapters of Habitat for Humanity that are building with energy efficiency as a priority are making a very necessary change. In addition to my obsession with community gardens, I am beginning to become fascinated with other aspect of community-sharing that seem to have beneficial effects on community building. Roseland describes cooperatives and cohousing, where residents share cars, computers, laundry services, meal preparation, and childcare to reduce living expenses. While I believe this could work, I am a little skeptical without seeing the ideas in action. The single-mothers I worked with were extremely distrustful of almost everyone they came into contact with, (justifiably so) and I worry they would have a difficult time with the sharing and especially with the childcare, although it would be extremely helpful to them if it did work, as it seemed to be their biggest obstacle to finding and maintaining employment. If I were a policy-maker, I may be a little more inclined to opt for the Beyond Shelter model, which provides the childcare center (among many other important services) as part of the program services. If I were a citizen activist though I would argue that the problem with this is that it is not a sustainable or empowering as the community members providing their own childcare for themselves. I thought that an aspect of Beatley’s example of Morra Park (Friesland region of the Netherlands) would probably work well in Denver; homes with 30% of the floor area “devoted to occupants’ primary economic livelihood” (294). Commuting in the Denver-metro area is a nightmare, and if there were a cultural shift towards more facilitation of working from home, I think many people would be thrilled. I am a big fan of buildings that “learn,” (to refer to Stewart Brand’s book) and so if I were a Denver city planner I would definitely move to implement more buildings designed to adapt to changing needs and uses, by layout and ability to be dismantled and reconstructed, such as the examples Beatley gives of the school houses in Nieuwland, (Amersfoort) or the dismountable police station in Boxmeer, or the Dutch National Building (299-300). Something that bothers me when I read about the need for density in cities is the fear of how this may reduce the natural light in the majority of spaces in densely built areas. So I was really excited to hear about some of the designs Beatley mentions that bring natural light into all areas of buildings. This is especially significant in the context of implementing these ideas in Denver, where sunlight is so plentiful, it would be detrimental to one’s wellbeing to sit in a windowless office all day – and unfortunately I know! (I tried to find an example of the “sun paintings” – the metal sculptures in the building that help to further bounce sunlight into the interior of the building, but I was unsuccessful. Too bad – I really want to see how it looks – I wonder if there’s a problem with glare?) The Queens Building at De Montfort University in Leicester is another example Beatley gives where bringing in natural light is a priority in the building-design. I think that while many of these wonderful examples would be possible from a bottom-up approach, it would be so much easier with support or at least influence from the top. As Beatley says, “an important lesson … is the potentially powerful role government can play as a facilitator and catalyst for sustainable building” (318). I hope that the Denver city government will continue to move towards taking on this responsibility! -Financing: Reinvestment policies: banks, insurance companies, and other depository institutions are required to reinvest significant portions of the capital they ‘extract’ from the community. -Skills training and small business development: the idea of creating a “sheltered” place to train local residents, using already existing or easily obtainable space and equipment, allowing for people to gain career training and for start-up costs for those businesses to be lower. -Interesting point made in the “Green Business” section: “More jobs will be created in energy efficiency, recycling, and public transportation than will be lost in the oil and coal industries, car manufacturing, and waste disposal.” It would be interesting to see projected number that correspond with that statement, since it seems that job loss is a huge point made in the debate over efficiency and transportation. -Green maps and a Green Business Directory would be great in cities, where so many similar businesses may exist (ie. cafes) that it is difficult to know the details on them all. Having a directory with information on local businesses could be great for a city like Ithaca, which already shows interest in sustainability, and could help stimulate awareness in other cities. -The idea of rideshare bucks, mentioned under ‘local currency,’ could be useful for Cornell in particular, as an incentive to increase carpooling by commuting employees and decrease campus car traffic. -Buy Nothing Day: November 29th. Maybe this is something that could be started (if it hasn’t already?) in Ithaca and especially on the Cornell Campus. It seems like it could have a huge impact, especially because it’s during the major kickoff of the holiday shopping season. -Industrial Symbiosis (Beatley): having wastes from one be inputs for another… A great step for creating closed-loop processes or industrial parks. To add another example, there is a waste processing facility (I believe in North Carolina), sited on an old dump, where the heat from the plant (which makes use of old infrastructure), is used to heat artists’ kilns, and ‘waste’ heat goes on from there to be used. This is a dump that is currently capped, and there are plans to expand to include a recycling/composting facility and recreational space. -Landscape Recycling & Adaptive Reuse – There is a large segment of landscape architecture that is devoted to this type of work, where ‘brownfields’ are reclaimed for new uses. Their designs definitely incorporate ‘green’ technologies and restorative processes, while giving abandoned or underused spaces new roles to fulfill. Roseland brings up the concept of “non-monetary transactions,” (169) in his “Community Economic Development” chapter, promoting a cultural mindset shift away from traditional economic goals. He gives examples of bartering and non-material transactions such as child- or elder-care offered by friends and neighbors. I was reminded of a tactic used by Habitat for Humanity, which I learned on the job when I was working as a case manager with homeless families. At the Habitat orientation, the required hours of “sweat equity” seemed to make several of the potential applicants nervous. One of the women in the audience asked how she would possibly be able to find and afford additional child-care to what she already had during the week while she worked. The Habitat staff explained that they encourage the new residents to trade off watching each other’s children while putting in their hours in constructing their homes. And as an additional way to facilitate and encourage this “non-monetary transaction,” Habitat deducts the hours worked from both the family doing the construction and the family providing the child-care. I found this to be an extremely efficient and effective way of building sustainable community (although I did not know those terms at the time I learned about it!). Roseland brings up some examples of the increasingly popular strategy of community economic development; “micro-enterprise loan programs” (170). Micro-lending is made possible by “financial intermediaries” who give small loans to low-income entrepreneurs who would not otherwise be eligible for such loans due to not having any collateral. These programs are generally organized as lending circles, where borrowers receive guidance from others who have successfully repaid loans and started their own businesses in the past. I am curious about the strategies of these “lending circles,” as an employee from Alternatives Credit Union who gave a presentation in a class I was in last semester mentioned that these types of lending circles are not as successful in the U.S. as they are in many foreign countries. While Roseland admits that the transition process into a more sustainable economy will “produce many losers,” he asserts his confidence that this consequence will be far outweighed by the “winners” (174) when it comes to jobs. Something that worries me, however, is that it seems possible that order of events in this transition process will be first: losers lose, second: winners win. I’m definitely no economic genius, (by any means!) but I’m just thinking that in order for many of these new jobs to be created, the money has to be there to pay the salaries, and so something has to give… is it jobs from the losers? Meaning that; although the winners may have the potential to outnumber the losers, society’s sense of confidence would be severely dented by the decline in “brown” jobs. There’s a good chance I don’t know what I’m talking about here – please feel free to let me know! In his “Rethinking Economic Development” section, Roseland provides some “tools” for how we can start changing things. He gives the example of “Buy Nothing Day,” (183) which is November 29th, and entails that if a critical mass of would-be-consumers choose not to buy anything on that day, this would reduce waste and output of pollution by staggering amounts. While I am a big fan of the idea, I have heard the argument that this strategy has proven to be ineffective, because unfortunately, the message of “consume less” is not what people take from it. The problem is, whatever people don’t by on November 29th, they will go out and buy on November 30th. Right? I chose to read the “Community Jobs in the Green Economy” report as my second reading. I found the Foreword to be extremely inspiring, and to those of you who are the “commenters” this week, I would recommend reading at least that page. I am completely in love with the simplicity and poignancy of this statement:“The national effort to curb global warming and oil dependence can simultaneously create good jobs, safer streets, and healthier communities. That is the chief moral obligation in the 21st century: to build a green economy strong enough to lift people out of poverty” (1). Again, my brain refused to venture into the world of economics, so I may be missing something here, but I felt like there was an integral piece missing from the Green Economy report. The report provides numerous examples of green jobs that will be available with new green technologies; however, it is not clear where the financial backing will come from to employ all of these people. 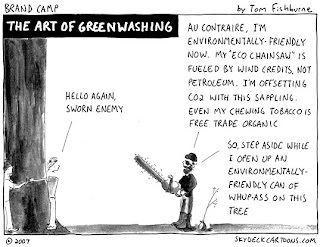 I think it’s semi-obvious that jobs in renewable energies will be paid for in the same fashion as energy is currently paid for – by the user to the energy companies. However; I am worried after hearing the example that (I think) Melanie gave in class of the energy company whose rates dropped so dramatically when they switched to renewable energies that they had to raise them again in order to sustain, and how the consumers were extremely angry about this. So my questions are (1) where will the money come from to pay these green workers: and (2) what sort of regulation would keep the capitalist mentality from negating the benefits? In general, I feel that in the majority of what we are reading, as idealistic as it seems, is not idealistic enough when it comes to a much needed cultural shift regarding capitalism. The Green Economy report is structured around ways that “every city and community in the United States has some potential to capitalize on this new economy” (19). I’m just frustrated with the acceptance of money as the only driving force for change. I just wish there was more talk on how to start making people realize that money doesn’t equal happiness. Everything in this report is about how everyone can make more money – but there is nothing about how this will require some people who have been at the top of the spectrum of wealth to take a (big) pay cut. I also appreciate the “cynicism is the problem, not the solution” comment from the Foreword. While being critical thinkers is of extreme importance, it is only helpful if it’s paired with the bravery to be a little idealistic, and take a chance on some unconventional ways of thought and practice. Over the weekend I attended NET IMPACT’s national conference at Vanderbilt in TN. NET IMPACT is a graduate sustainable business organization that is working to change the future of business through sustainability. While I did manage to find the time to read the homework, I feel like as this conference was all about economic development it would be more beneficial to share with you all what I learned. As for commenting, I will raise several questions on economic development discussed at the conference that you will be able to answer using the tools given to us in the reading! In terms of sustainability, you have two basic forms of economic development: economics for the rich and economics for the poor. With this divide comes the question; is sustainability a right or a privilege? If it is a right how can we make it cheaper? The problems with sustainability being a right include quality of life. Being more sustainable often equates to having a better quality of life. People, especially Americans, work tirelessly to achieve the American Dream—something that will supposedly improve your quality of life so does this mean that the same degree of sustainability should be available for the wealthy and poor? Here is a case we discussed. Let’s say you have a wealthy person who buys a solar panel. The solar panel breaks in a couple of years, but still manages to squeeze some juice out. What are the ethical implications of selling this broken unit to a poor community (particularly in a third world country)? Would this situation be considered an act of good-will or one that is unethical? The conclusion I have made is that it was an act of good-will although the unit is almost broken. Here is why: Firstly there is knowledge associated with owning a unit such as this. The economically disadvantaged often do not have the resources to acquire something as technologically advanced and expensive as a solar panel. If something like this is given to the poor they would firstly be given knowledge that something such as solar power exists. Secondly, they would feel a sense of accomplishment and satisfaction for possessing such a “powerful” asset. Finally, there is always the potential for resale after the person wants to “upgrade” to a better solar panel using the savings made from not having to pay for electricity. Here is another thought to play around with…Is a socially responsible, for-profit organization an oxymoron? This was an issue addressed many times- I feel unnecessarily, at the conference. To me, for profit just indicates that all extra profits made by the company go into retained earnings or are given as dividends. Because something is for profit has no link to being socially irresponsible. What do you think? One final topic I would like to discuss is Micro financing. While this concept was thrown around a great deal at our conference, the most interesting thing to me was an organization called KIVA. Check it out! Kiva.org You lend money to startup businesses and it helps them to enhance the economic development of their community. It is just a loan too! Bill Clinton has done a great deal with this organization and if you check it out, you will probably find it pretty interesting. Any thoughts on it? Personally, I think it is an absolutely fantastic program for several reasons. First of all, it is quick and easy, secondly it doesn’t take much money and finally you can see the progress the person you donated the money to made with what you leant. Seeing the results of what your money does is fantastic because you actually feel like you made a difference. To me, it’s a no-brainer! Please, tell me what you think- I’ve been surrounded by these questions all weekend and although they are not about the readings we did, I know we can apply them to my line of questioning. "The Green Wave is coming, will it lift all boats?" "The Unbearable Whiteness of Greening"
I have decided to look at the Ella Baker Center for Human Rights, which is mentioned in the Apollo Alliance publication "Community Jobs in the Green Economy." The slogan for the national nonprofit is "Working for JUSTICE in the system, OPPORTUNITY in our cities, and PEACE on our streets." Among the several programs that Ella Baker is involved in I wish to highlight the "Green for All" initiative. The purpose of this program is to "ensure that this green economy is strong enough to lift people out of poverty." Ella Baker successfully advocated nationally for The Green Jobs Act of 2007 that was passed by the House of Representatives as part of a "sweeping" energy bill and would authorize as much as $125 million for green jobs training. At the local level, Ella Baker through Green for All has formed the Green Jobs Corps in Oakland, CA. This pilot project seeks to demonstrate that green economic development is the path out of poverty. The Green Jobs Corps is a partnership between local community development corps, unions, and the City of Oakland. Green for All also hosts ongoing "Solutions Salon" with the title of an upcoming session "Green Cities, Brown Folks: Sustainable Solutions for a Safe and Healthy Oakland." The free event includes food and music and will feature leaders in the East Bay who are on the cutting-edge of creative environmentalism that is rooted in communities of color. My assessment of Ella Baker's green initiative is that they are extremely successful in disseminating knowledge and empowering people of color. Instead of looking at the green economy as "white" based Ella Baker is creating part of the green economy and through their work people of color are becoming leaders in the movement and more are poised to become strong and creative thinkers. These are all outcomes that are at the core of the justice movement. I found their work to be by far the most inspiring I have read or heard about in this class. I also commend the program more generally for their effective website and obvious strong organizational skills, all necessary to effectively disseminate their mission. Admittedly, economic development is not one of my strong points, so this blog is quite difficult for me to write. Nevertheless, here are some of the ideas and examples that I took away from this week’s readings. In this age of globalization, the idea of community based economic development might prove difficult to promote. Not only do large, trans-national corporations place sustainability on the back burner as they make decisions about expansion and involvement in the global market, but local businesses as a whole also appear to place more emphasis on short-term economic growth than on long-term improvements to society as a whole. Although this week’s readings provide many examples of companies and localities who have managed to integrate economic growth with sustainable practices, I do not necessarily believe that most companies are ready or willing to adopt such practices. Being inexperienced with economic development, I still have many questions. Specifically, if green development is truly as affordable and accessible as many claim, then why don’t more companies pursue it? Moreover, can such practices (which emphasize local production and consumption) truly find success in a globalized market, or will they simply fizzle out as capitalist enterprises gobble up the globe searching for the next available and exploitable source of capital and labor? Keeping these questions at the back of my mind, I will discuss one eco-friendly economic development scheme that I found particularly interesting. On page 184, Beatley begins an interesting discussion about landscape recycling and adaptive reuse. He focuses his energy on the Emscher Park International Building Exhibition in northwestern Germany. This complex managed to convert an industrial brownfield into a vibrant mixed-use community. Once a wasteland, the site now boasts a wide range of facilities including artist studios, a museum, public bike paths/parks, and private residences. By cleverly reusing the land, Emscher Park minimizes its ecological footprint by slowing urban sprawl, reducing pollution emissions, and bringing community members together. At the same time, the development has jumpstarted economic development in a once decayed region. Perhaps there are several things that we can learn from such development here in Ithaca. Reflecting upon Connect Ithaca’s PRT plan, I remember that we discussed the possibility of a mixed use development installation next to the Gun Hill apartment complex. If we were to retrofit the old factory for some sort of new use, then we could accomplish many of the same things that were accomplished at Emscher Park. In fact, our site might prove even more environmentally friendly than Emscher Park because it will be linked to a sustainable mass transit line that services all of Ithaca. We could certainly use this site creatively to improve quality of life and promote economic development within Ithaca. For example, we might provide cheap studio space for local entrepreneurs and artists who desire to start a business or open a gallery. We could also supplement this commercial development with more cultural enterprises—perhaps a museum that celebrates local history or some sort of public park that encourages community interaction (though neither of these two things would necessarily generate revenues). Though creative, I understand that this scheme poses many logistical challenges. For example, development of this sort, especially if we seek to preserve the factory and minimize our ecological footprint, is very expensive. Moreover, the site is already highly contested within local government. Not only do residents and officials desire to preserve the view of Cayuga Lake, but I believe that environmental impact studies have found toxins of some sort within the factory or perhaps integrated into the soil. Such toxins would be incredibly expensive to remove. So even if adaptive reuse of the site will yield positive returns in the long run (which I'm not sure that it would) it will be incredibly difficult to sell this proposal to local residents and officials. Today, a greater amount of attention is beginning to focus on our cities aging infrastructure. Recent event in New York City, with a major steam pipe bursting, and in Minneapolis, with the collapsing bridge, have brought more attention to this issue. Many expect that as our cities age and their infrastructure begins to wear, incidents like this will become more common. In reading Edens Lost and Found (Introduction and Los Angeles chapters), there is discussion of the errors that took place in creating our major city’s infrastructure. It occurred to me that as this infrastructure approaches the end of its usable life we have a great opportunity to replace those systems with ecologically superior models, and greatly improve our environment as well as the overall livability of our cities. Los Angeles represents a terrific example of this because its initial infrastructure was so terribly designed by modern standards that perhaps it has the most to gain from its reformation. 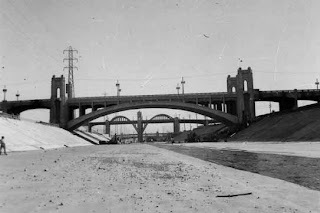 There are two terrific examples of infrastructure modernization that can make a great difference in LA, floodwater management and transportation. Los Angeles created a flood management system that pushes all flood waters into giant concrete river basins that divert all water outside of the city. These basins not only do a disservice to the city by removing water that could be put to use, but they also serve to create massive dissections of the city which have an enormous and negative affect on pedestrians and all city dwellers who are now greatly discouraged from crossing the basins. In Edens Lost and Found, the concept of cistern-and-swale technology (though I hesitate to use that term for such a low-tech idea) is discussed as a more viable solution to the massive flood basins currently in place. This technology manages flood water and effectively retains it for later use. The impact of the use of cistern-and-swale instead of the massive basins could have a great impact on the city through improved use of storm water and allowing greater mobility across areas of the city that are affected by these great boundaries of concrete. Another example of a devastating infrastructure choice made by the city of LA that offers great opportunity for improvement is that relating to transportation. LA is notorious for its traffic, and for good reason. The city was built up around the automobile. LA’s concrete jungle nearly requires inhabitants to use an automobile to get through it. However, as LA’s huge number of bridges and overpasses age, the repair of the auto infrastructure will become more and more expensive. Combined with the price of fuel, there will be great pressure to develop alternative methods of transportation. Though Californians love their autos, it only makes sense that we would have to question the increasing costs associated with maintaining an increasingly expensive and inefficient mode of transportation in light of smarter technologies that move LA’s citizens to work, home, the beaches and the malls. All in all, our aging cities offer the greatest opportunity to make a real impact on the environment and on the quality of life through smarter infrastructure choices. More people, more money and a greater overall impact make our cities great candidates for an all new infrastructure boom in this country similar to the one that took place in the early-to-mid 20th century, but smarter and more environmentally and socially sound. In the past few weeks, we have seen some interesting Urban Nature presentations of a very general nature that have been useful in opening discussions on human-wildlife interactions and conflict, etc. At this point, we should moving towards more field observations and reports and less internet work. As an example, I have included a web link below to the kind of work imagined. Let's get creative! Collect some leaves and look for diseases. A tree or leaf handbook and some wax paper are all the materials required. Observe the multitude of migrating birds coming through Ithaca and relate your urban wildlife observations to current environmental issues. Find out where all of the jack-o-lanterns went, and why they aren't ending up in compost heaps in community and home gardens. Let's get those "naturalist" juices flowing and try some observation based hypothesizing. Betros, H. F. 1972. Understanding Schoolyard Ecology. Jericho, NY: Exposition Press. Classroom organization techniques plus many activity chapters on plants, animals, soils, and water. Blaustein, E. and R. Blaustein. 1978. Investigating Ecology. New York: Arco Publishing. Open-ended set of projects based on ecological principles. Each project has a background section, procedures, and ideas for further investigation. Booth, C. R. Ecology in the National Curriculum: A Practical Guide to Using School Grounds. Winchester: Learning Through Landscapes Trust. The British National Curriculum's attainment goals and programs for study for ecology are defined in this resource, as well as outlining investigation questions and methods. Bowman, M.L. 1976. Environmental Education in the Urban Setting: Rationale and Teaching Activities. Columbus, OH: ERIC/CSMEE. Busch, P. S. 1972. Exploring as You Walk in the Meadow. J.B. Lippincott Company. Carman, S. 1992. Guidelines and Features for Outdoor Classrooms. Indiana Department of Natural Resource. Planning for the development of your schools outdoor lab. Corvine, C.; Welting, W.; and E. Arms. 1988. Beyond The Classroom: Exploration of Schoolyard and Backyard. Lincoln, MA: Massachusetts Audubon Society. Introductory section gives rationale and strategies for using the schoolyards for science. Contains a collection of 33 activities in life, physical, and earth science. Clark, R. and P. Walters. 1992. Trees in the School Grounds. Devin, England: Southgate Publishers. Background text enhanced with detailed illustrations, this book devotes many chapters to tree activities and projects, such as "discovering tree dwellers", and "investigating wood properties." Cronin-Jones, L. 1992. The Schoolyard Wildlife Activity Guide. Tallahassee: Florida Game & Freshwater Fish Commission. Contains a curriculum framework, identifying key ecological concepts addressed in the lesson plans, 35 individual activity lessons, and large appendix and cross reference section. Debris, J. 1989. Schoolyard-Backyard Cycles of Science. Cartage, IL: Good Apple. Features reproducible activity pages in physical, biological, earth, and space science. Major emphasis is placed on starter activities to prompt children to ask "why?" Denny and Hand. Exploring the Secrets of Meadow-Thicket: A Story of Seasonal Activities for the Curious Child. Cooperative learning activities usable in local parks, fields, lawns, or lots. Dunning, E. and A.B. Mills. 1992. Backyard and Beyond: A Guide for Discovering the Outdoors. Golden, CO: Fulcrum Publishing. A how-to book on stalking, tracking, and observing common backyard critters. Gale, W. and P. Warren. 1989. Ecology Discovery Activities Kit. West NYC, NY: The Center for Applied Research in Education. 49 Easy-to-use, hands-on activities covering the essential areas of ecology: populations, communities, food web/energy flow, recycling. Good for grades 4-8. Hancock, J. 1991. Biology Is Outdoors! : A Comprehensive Resource for Studying School Environments. Portland, ME: J. Weston Walt. Consists of 10 investigations in and around the school grounds. Each investigation has reproducible student pages, a teacher's section, spin-off ideas, and references. Hogan, K. 1994. Eco-Inquiry: A Guide to Ecological Learning Experiences for the Upper Elementary/Middle Grades. Dubuque, IA: Kendall/Hunt Publishing. In-depth curriculum focusing on nutrient and energy cycling in ecosystems. The three modules incorporate cooperative learning, inquiry techniques, and alternative assessment. Hunker, J. 1994. Ecology For All Ages. Old Saybrook, CT: Globe Pequot Press. Investigative activities and background information about the following topics: backyard ecology, water systems, fields and borders, trees and woods, and dry zones. Johns, F.; K. Liske; and A. Evans. 1986. Education Goes Outdoors. Menlo Park, CA: Addison Wesley Publishing. Outdoor activities to integrate into all aspects of curriculum: science beyond the classroom, schoolyard math, outdoor language adventures, group building activities, etc. McCormack, J. 1979. Outdoor Areas as Learning Centers. Columbus, OH: ERIC/CSMEE. Perdue, P. 1991. Schoolyard Science. Glenview, IL. : Goodyear Books, Scott, Foresman, and Co.
25 class-tested activities to develop cooperation, thinking, and process skills in physical, soil, life, and environmental science. Grades 2-4. Roth, C. and L. Lockwood. 1979. Strategies and Activities for Using Local Communities as Environmental Education Sites. Columbus, OH. : ERIC/CSMEE. Russell, H.R. 1990. Ten Minute Fieldtrips. Arlington, VA: National Science Teachers Association. Chapters devoted to different areas of science (includes an ecology section), with lots of teacher background, schoolyard fieldtrip possibilities, and related classroom activities. Schaefer, J., et al. 1992. Schoolyard Ecosystems for Northeast Florida. Tallahassee, FL: Florida Advisory Council on Environmental Ed. Focus is on schoolyard enhancements like trails and specialty gardens. Schiff, P., and C. Smith-Walters. 1993. Wild School Site: A Guide to Preparing for Habitat Improvement Projects on School Grounds. Western Regional Environmental Education Council. Shaffer, C., and E. Fielder. 1987. City Safaris: A Sierra Club Explorer's Guide to Urban Adventures for Grownups and Kids. San Francisco, CA: Sierra Club Books. A unique book of ideas for urban fieldtrips in many subject areas: food, trash, and energy expenditure, city people, etc. One chapter devoted to neighborhood wild places. Smith, D. 1984. Practical Ecology Series. Urban Ecology. London: George Allen and Unwin Publishers, Ltd.
A British resource containing 24 exercises in three main areas of focus: disturbed areas, man-made niches, and pollution. Thomas, Gill. 1993. Science in the School Grounds. Southgate Publishers. A British resource with major sections in weather, mini beasts, trees, ponds, grassed areas, wild flowers. Appendix has teacher/parent background sheets and pupil worksheets. Williams, G. M., and W. H. Dowdeswell. 1990. Ecology For The National Curriculum. London: Unwin Hyman. Investigations based on ten easily accessible habitats likely to occur around schools. Young, K. Using School Grounds as an Educational Resource. Learning through Landscapes.